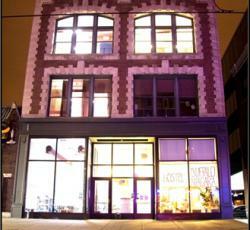 Hostel Buffalo-Niagara is conveniently located in down-town Buffalos Theater Area. This non-profit hostel is a perfect house base for those wishing to explore Niagara Falls along with the City of Buffalo. I was impressed by everything about this place, I&'ll certainly be back! Nice hostel. Good location and very very good common areas. Large kitchen and huge rooms. I always stay here when I come to Buffalo as you can&'t beat $25 a night for the location right downtown. It&'s an appealing building which is conveniently located. Within walking distance to Allentown and situated right inside the theatre district. Very clean and a great value. Great common location and kitchen. Very accommodating staff. The spot is kept tidy. Cozy spot to stay. Very warm and friendly staff. Huge rooms and a massive kitchen. Super secure. A little too much after my room card stopped working and i was stuck for a few hours inside the arvo as staff don&'t work during the day. In my pjs. Room was spacious. Good television region inside the basement (not a lot to do in Buffalo at night) some classic VHS tapes that will make you really feel nostalgic. * Hostelling International Buffalo Niagara rated 4.78 out of 5 based on 9 customer reviews. Hostel reviews with a star rating are sourced from HostelBookers. If you find Hostelling International Buffalo Niagara with the same booking conditions at a lower rate somewhere else on the internet after you have booked, we will refund you the total difference.